Sleeping, Lt. Gordon Miller of the NYPD recalls an event called “the Massacre” during the City at War crisis when his arm was scarred by a vial of acid hurled at him by a Foot Elite. Miller is woken in the dark hours of the night to report to a crime scene where the corpses of more Foot Soldiers have been found. 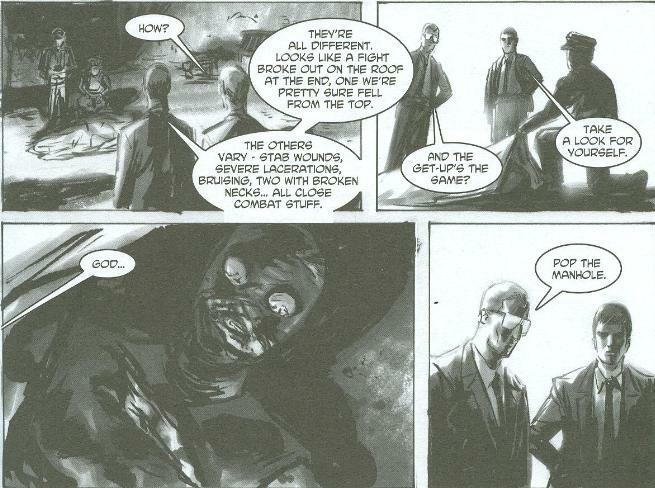 Once there, Miller meets with Officer Whitmire who shows him the bodies, as well as traces of a strange substance near a manhole cover. In a dumpster, they find a surviving Foot Soldier and decide to take him to the old 5th Precinct building (which is nearly empty due to a scheduled department move) for questioning. On the ride there, Miller recalls another event he endured during the City at War, where he was rescued from a Foot Soldier’s blade by a strange creature armed with sais. In the interrogation room, they call in Officer Lin to translate the Foot Soldier’s Japanese. The ninja merely mocks her and then, in English, decides to tell Miller everything about the death of Oroku Saki and the Foot civil war between Karai's Japanese branch and the remaining Shredder loyalists in New York. Lin excuses herself while Whitmire gets a call from the lab. The strange substance by the manhole cover was carapace – turtle shell. Suddenly, the power in the precinct goes out and all cell-phone reception is inexplicably jammed. The handful of officers in the building convene and then return to the interrogation room, only to find their prisoner has been murdered. The sprinklers then go off and as the officers rush into the hallway a Foot Soldier opens fire on them with a machinegun. Whitmire is winged while all the other officers are killed, though Miller takes the ninja out with his gun. Miller and Whitmire work their way through the Precinct, only to find more of their men murdered. Suddenly, several Foot Soldiers separate them and gang up on Miller. Miller runs out of bullets and things look grim until Leonardo (disguised in a hoody, scarf and cargo pants) rescues him. In the hall, Raph (similarly disguised) rescues Whitmire from his assasins. Miller wants answers, but Leo insists they haven’t the time; a bomb just went off and, according to Mikey (who radios them from the roof) the Precinct is on fire. They meet up with Mikey and attempt to escape through the front, only to be driven back inside by sniper fire. Without warning, a Foot Elite attacks and Leo fends him off while Mikey and Raph lead the cops to a window. They escape into a parking structure, only to find more Foot Soldiers being led by… Lin!? Apparently, she is with the remaining Shredder loyalists from the Foot civil war. She’s been working undercover in the NYPD for years and now that Miller and Whitmire know too much, they must die. Mikey and Raph take on the Foot Soldiers and Leo continues his fight with the Foot Elite into the parking structure. Miller borrows Whitmire’s gun and does his part. He sees the Foot Elite pulling out a vial of acid, and suddenly realizing it was the same Foot Elite who scarred him during “the Massacre”, shoots the vile in his hand. The acid kills the Foot Elite while the splash nails Lin’s face, disfiguring her. Lin and the Foot escape while Mikey insists that he and his brothers ought to disappear. Miller still wants answers, though, and Leo tells him to meet him alone at the ruins of the 2nd Time Around shop. At the shop, Miller and Leo have their pow-wow. Leo gives Miller a cliff’s notes version of the Turtles’ history with the Foot and cause of the recent City at War. Miller believes the Foot’s infiltration of the NYPD may run deep, but promises to investigate and keep the police off of the Turtles’ backs while he’s at it. He and Leo then shake hands and part ways. *This issue takes place shortly after TMNT Volume 2. The story continues in Tales of the TMNT (Vol. 2) #56. 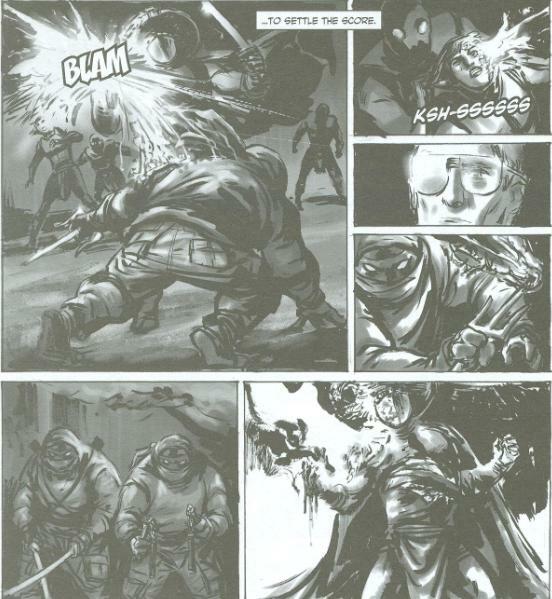 *The Shredder was killed, for good, in TMNT (Vol. 1) #21. *Goseico is referenced in this issue. They were shown previously in cahoots with the Foot in TMNT (Vol. 1) #9, not to have those ties broken until Tales of the TMNT (Vol. 2) #22. *The “City at War” began in TMNT (Vol. 1) #50. The Foot civil war ended with the deaths of the Foot Elite Guard and the truce brokered between the Turtles and Karai in TMNT (Vol. 1) #61. *Raph references, “Donny ‘n Splinter are still up north,” which is where they were left at the end of TMNT (Vol. 1). However, according to author Tristan Jones, this storyline takes place after TMNT (Vol. 2), when Donatello had returned to New York with his brothers. No-Prize: Don was just chillin’ in Northampton for the Hell of it. Of course, Leonardo later claims he hasn’t seen him for “nearly a year”, so… whoops? *This issue also included two bonus pages of sketches by artist Paul Harmon. 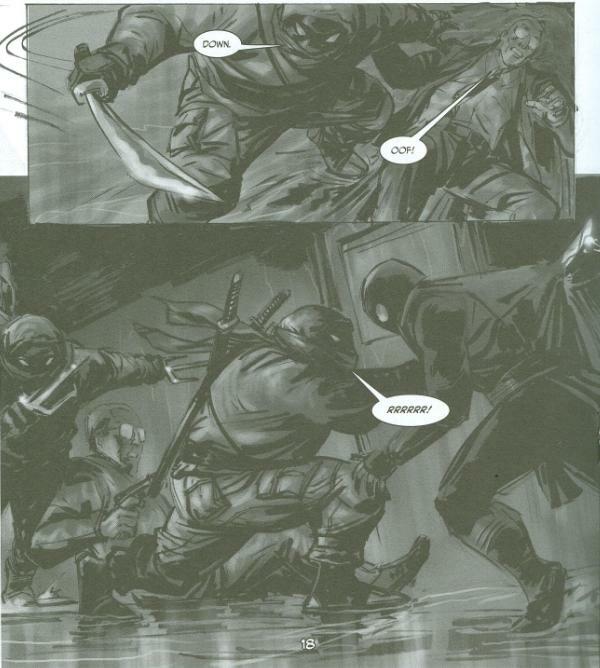 Tristan Jones’ “Gang Wars” arc in Tales of the TMNT (Vol. 2) was a game-changer. It brought a fresh new perspective and a fresh new look to Mirage’s only consistently published TMNT title that was, by that point, going off the deep end with sci-fi and supernatural plots in rapid succession. With an approach that basically boils down to “CSI: Ninja Turtles”, we got a uniquely “real” take on the TMNT, all from the POV of the cops who so frequently have to clean up their messes. 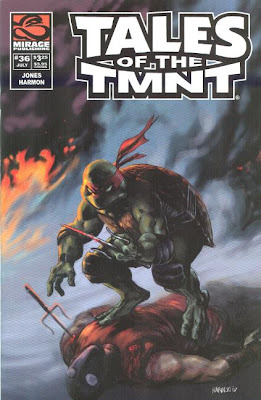 This story acts as something of a sequel to the epic “City at War” arc which ended the original volume of Eastman and Laird’s TMNT, calling back to several of its events and continuing the conflict we’d thought was resolved. While showing Lin and the Shredder loyalists still out and about causing mayhem somewhat diminishes the resolution of the original “City at War”, the bold and offbeat means of delivering the story is well worth the re-ignition of a storyline that by all appearances had no more to say. “To Serve and Protect” is pretty well grounded, an effect driven home by the gorgeously gritty and dark artwork of Paul Harmon. Harmon has a way of capturing the insanity of the world the TMNT live in through a lens of sobering reality, so by the time you reach Page 3 and see a corpse dressed like a bug-eyed ninja, you realize just how bizarre and surreal the life of a New York City detective in this universe must be. There have been a lot of comics that try to take this approach (the Batman title “Gotham Central”, for example), but the mix of Harmon’s intimidating eye-level art and Jones’ believable, matter-of-fact dialogue and inner narration sells it in a way few can match. “To Serve and Protect” does suffer in a few places, though it’s mostly the fault of the delivering medium than the story-itself. This was just one episode in an ongoing anthology series that bounces around an established timeline, with no guarantee of devotion to any potential ongoing plotlines. So “To Serve and Protect” has to get as much as it can accomplished in one issue, tying up enough loose ends so that it can work as an isolated piece should Mirage not want to follow up on it. And that almost happened, too (it took twenty issues for the sequel!). As such, you have characters like Lin, who need to be introduced and deliver their shocking betrayal in a single issue; something that would have flowed better over a multi-issue storyline where we got to know Lin before she turned coat, which might have actually made her actions less telegraphed. Jones has come under some criticism, too, for writing the TMNT on a “sliding” timeline. Some authors, like Peter Laird, write the TMNT on a “static” timeline, meaning the dates are hard rules and the Turtles age more or less in “real time”. Jones uses the “sliding” technique, ala Marvel and DC, where no matter how old the book is or however long ago a story takes place, it is always “the present”. On a static timeline, this story should by all rights take place at a point when cellular phones were the size of a loaf of Wonder Bread, but they’re not. Personally, I don’t really mind either way. Mirage’s TMNT comics have never been consistent in regards to sliding vs. static timelines and it varies on the whim of the writer, so Jones isn’t the first to do something like this. Mirage’s lack of commitment to Jones’ “Gang Wars” storyline was a real shame, as they were unable to finish it before the cancellation of Tales of the TMNT (Vol. 2) and the buy-out by Viacom. We may never get a conclusion, which is disappointing, but we should also be thankful for what we got. This first installment in the arc is my favorite and it really stands out as a definitive gem amongst not only this volume of Tales of the TMNT, but the entire TMNT library as a whole. I also want to point out that Mike LaRiccia’s frontispiece is really, really cool. If any issue deserved an A+ from Mark, then this was it! This issue actually made me request my local comic shop to start stocking TMNT comics! The TMNT dressed as..uhm...ninjas are really awesome!